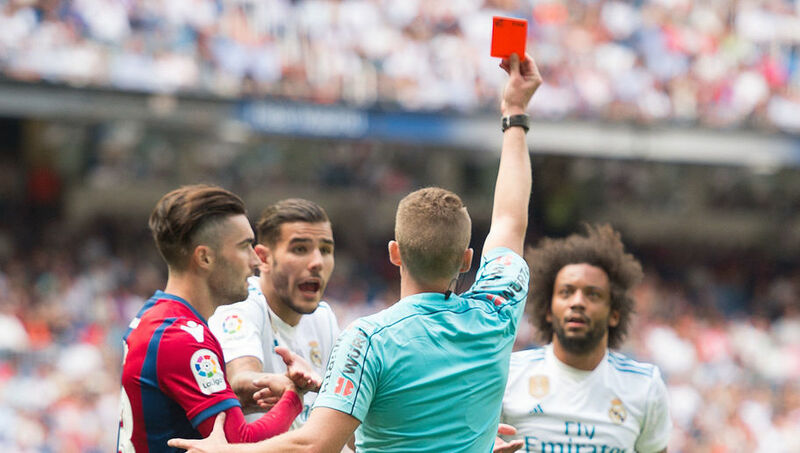 Marcelo’s two-match ban for kicking Levante’s Jefferson Lerma has been reduced to one match by the Spanish Football Association (RFEF). The Brazilian was dismissed for kicking out in Saturday’s early kick off and will now miss the upcoming trip to Real Sociedad, but he will return for the home game with Real Betis after an appeal from Madrid was successful. Theo Hernandez, who signed from cross city rivals Atletico Madrid – is expected to replace the full-back this coming weekend. Having failed to beat Valencia prior to the international break, Madrid boss Zinedine Zidane knew his side had to beat Levante on Saturday to keep up with Barcelona. However, a poor start to the game against the Valencian based side saw Ivi open the scoring, spinning past Dani Carvajal before slotting past Keylor Navas. The game was largely dominated by Madrid but with very few chances and Zidane’s early misery was compounded further as Karim Benzema was forced off with injury, being replaced by Welsh winger Gareth Bale. Madrid did level through the lively Lucas Vazquez, who tapped home following Sergio Ramos’ saved effort from Raul Fernandez. Madrid have now failed to win their first two matches at home for the first time since 1995. Next articleEx-footballer Clarke Carlisle ‘missing’!